Transform your blasé rocker light switch into a gothic statement piece. Your home...it's alive! Inspired by old-fashioned electrical throw switches—like the one flipped to bring Frankenstein's monster to life—Lance Nybye's ornate design transforms your blasé rocker light switch into a gothic statement piece. The plywood switch plate is laser-engraved with coils around the terminals and at the top and bottom signify on (connected) and off (disconnected). Made in San Diego, California. Click here to check out our Original Toggle Switch Plate . Lance Jr. & Sr. stumbled upon the idea of jewelry design after a fire consumed their previous business of laser engraving bats. The bat business never made a full comeback, but they found a creative way to reinvent themselves. While attending weekend craft shows and weeknight street fairs, they had the idea of using the equipment they already owned to make wood laser-cut earrings. 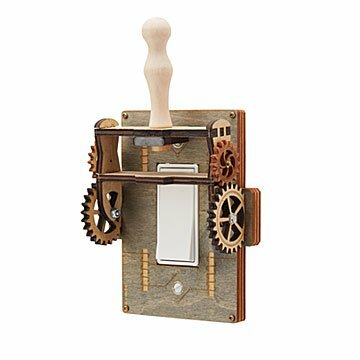 In addition to winsome wood accessories, the duo also creates brilliantly designed light switch plates, clocks, and other earthy and artful accents for the home. also by Lance Nybye Jr. Cute gift for someone who is handy and loves a good idea and unique offbeat gift. The design is a great 3D representation with a slim profile. I was pleased that its use would not be limited to large areas. This had cool written all over it. I love the design and my son was able to change a toggle switch to a rocker to accommodate the function. The materials are more lightweight than I would like for everyday use. Almost like balsa. My son has already installed it, in his home. It is much cooler than an ordinary light switch! I paired it with a mad scientist sculpture. Looks good together, except I'm afraid it will fall apart with use. The raw wood parts (like the handle) stain easily. It's a very fun piece, but at this price I think it should be higher quality. was excited about how it looked in the catalog but when I rec'd it, it was cheaply made and was an overall disappointment ... do not buy it unless it goes on sale. Husband was quite pleased with his switch plate. "Oh Hunny, It goes with my garage theme. The Grandson will get his when his parents move into their forever home next month.